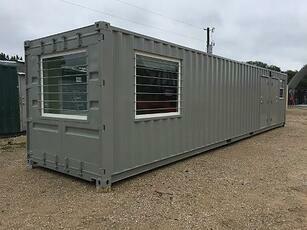 If you're building a work camp in an area where temperatures sometimes reach extreme highs or lows, it's important that you choose modified steel shipping containers that will serve to protect your workers and your materials. Good insulation and an HVAC system can keep temperatures and humidity levels constant during harsh winters or sweltering summers, improving work and living conditions. Whether you're trying to keep the heat in or out, insulation is a key component of modified shipping containers. Without proper insulation, even the most sophisticated HVAC system will be ineffective at controlling the temperature. At Falcon Structures, we use highly effective insulation to insulate the ceilings, walls, and doors; a small space will be left to accommodate the HVAC system. Consistency in the application is key - just a few gaps in insulation can create unwanted pockets of heat exchange. Size - Smaller containers can be climate controlled using a smaller system, while larger containers will require a larger system. Quality - It's always a good idea to choose a high-quality HVAC system, but it's especially the case in remote work camps, where you might not be able to get prompt repair when necessary. An HVAC system doesn't just help with temperature control - it also helps with air quality and humidity. Good circulation is key for safe living conditions. An HVAC system continually filters air and supplies the modified shipping container with fresh air from outside. In addition to making the containers livable for workers in extreme weather, creating a climate controlled shipping container helps to protect both the workers' and the company's belongings. For example, many items used in a work camp respond poorly after exposure to extreme heat. Climate control can prevent damage to valuable IT assets and energy production equipment. Areas where extreme heat is a problem often experience issues with humidity, as well. Humidity can damage paper records, medical supplies, machinery, and more. It's not unusual for work camps to be located in areas where heavy storms or high winds are an issue. Traditional mobile homes and modular housing units aren’t always equipped to withstand hurricanes, tornados, and major precipitation. Steel shipping containers, on the other hand, are inherently durable and water-tight. Their corrosion-resistant exteriors help to ensure years of maintenance-free ownership. If you have any questions, you can always call us at 877-704-0177.